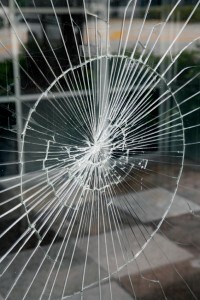 Broken window glass can present a danger, a security risk or just be unsightly in your home or business. The best solution is to have your glass replaced as soon as possible to eliminate any of these problems. As glass experts Valiant offers a fast and reliable mobile window glass repair service throughout the Sydney metropolitan area. There are many different types of windows ranging from small colonial style domestic windows through to large glass panels in commercial buildings. Our factories stock most types of glass, which enables us to provide a same day or next day service in most of these situations. Glass is a dangerous product and must treated with respect and therefore we advise that you do not try to remove any glass prior to our glazier visiting your site. Some types of glass such as laminated or toughened safety glass are safer to handle, however annealed or float glass can be very dangerous. The breaking characteristic of non safety glass products tends to present knife like shards that are razor sharp, which can easily cut through skin, muscle tissue and tendons. A trained professional should carry out this type repair to prevent these types of injuries.